This tutorial shows how control the hardware timers of an STM32 microcontroller. We will show it based on the STM32F4-Discovery board, however controlling the timers of other STM32 devices is very similar. 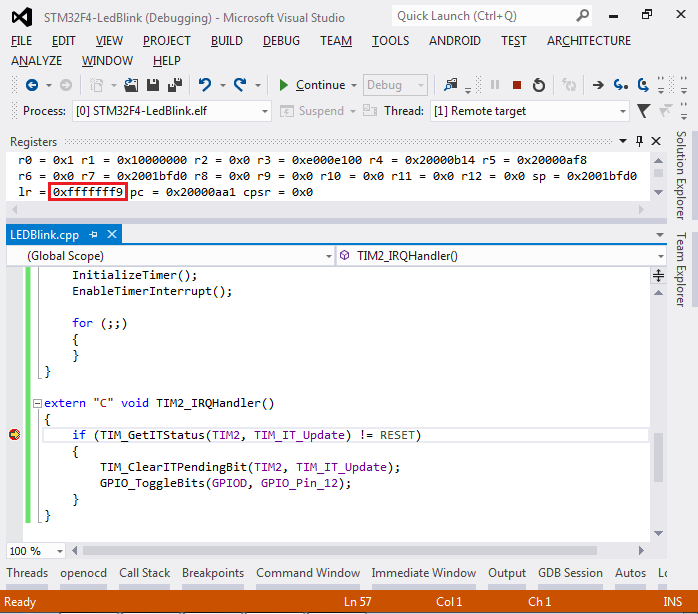 Warning: this tutorial describes the legacy StdPeriph interface. To learn about controlling the timers using the new HAL interface, follow this tutorial instead. Before you begin with this tutorial please create a basic project for your STM32 device (e.g. by following this tutorial for STM32F1 series devices or this tutorial for the STM32F4-Discovery board). Run the program and notice how the LED blinking pattern has changed. Now instead of polling the timer value constantly and switching the LED on and off on certain threshold values we simply wait for the TIM_IT_Update interrupt and toggle the LED once it arrives. Note that you only need extern “C” if you are building a C++ program. Note that the link register (lr) that normally contains the return address of a function contains the value of 0xfffffff9. This is a special value denoted as EXC_RETURN in ARM Cortex CPU documentation. It means that the current function was called by the CPU automatically as a result of handling an exception. Run your program. You will see how the two LEDs blink with different frequencies independently. The loop inside main() that controls the orange LED does not need to do any extra checks to control the green LED. The timer automatically pauses it and transfers control to TIM2_IRQHandler() each time an update event occurs. The g_pfnVectors table contains addresses of interrupt handlers such as TIM2_IRQHandler(). Furthermore, unless you explicitly provide a method for a given interrupt handler, such as TIM2_IRQHandler(), GCC will automatically substitute it with DefaultHandler() that will halt your program. 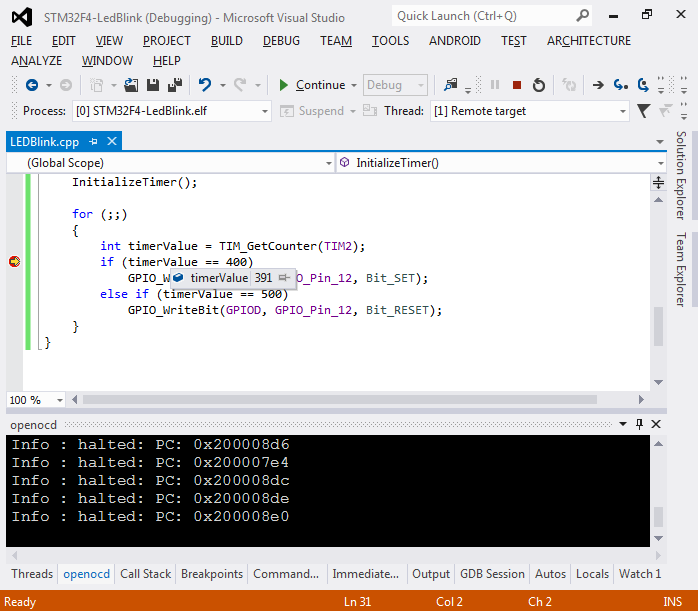 To learn about controlling the STM32 timers using the HAL API, follow this tutorial.